One Monday afternoon in October, I had the pleasure of meeting Phoebe Wahl, who is a junior illustration student at RISD. She’s taking a class with my friend and former teacher Judy Sue Goodwin-Sturges this semester, so Phoebe must have learned about my artwork from her. 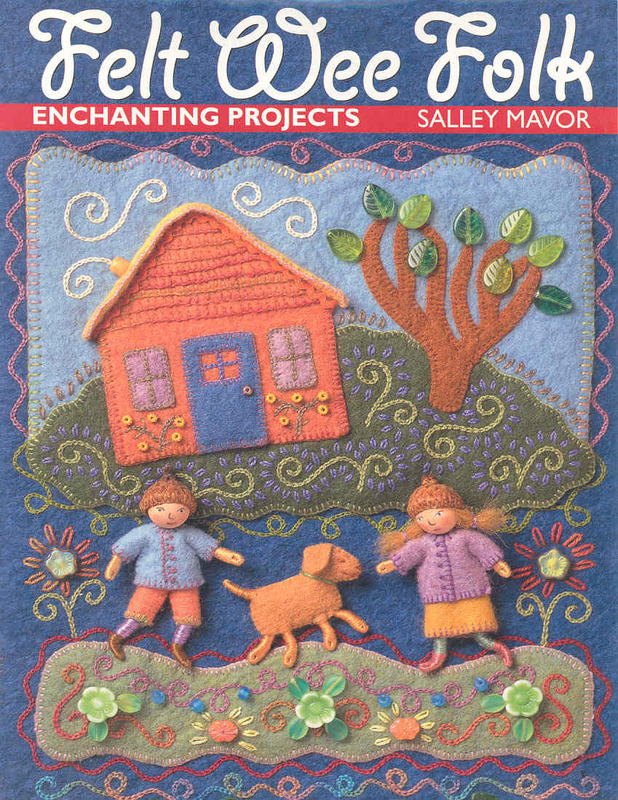 She sent me an e-mail with a link to her blog and I was so charmed by her paintings and cloth characters that I invited her to visit my studio. 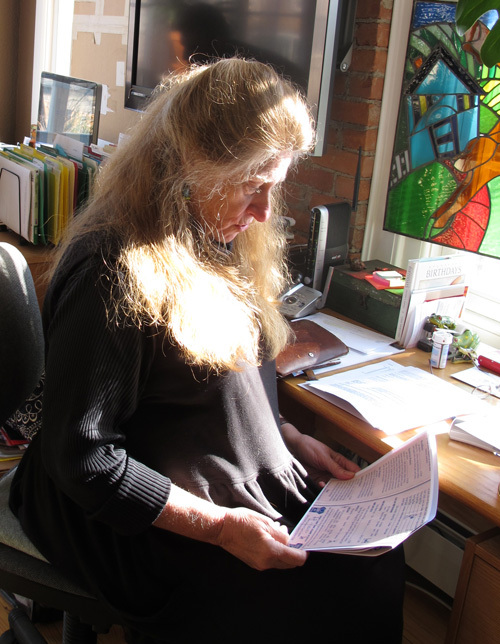 It’s a manageable distance, so she took the bus from Providence to my home on Cape Cod. 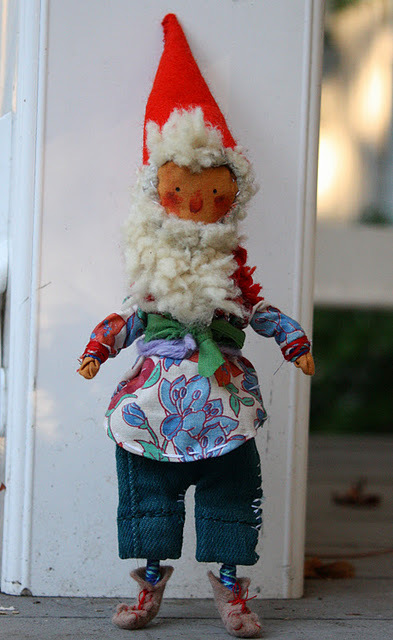 She gave me this gnome doll, which she had made the night before. I love how she works quickly, so her dolls are fresh, not fussy. 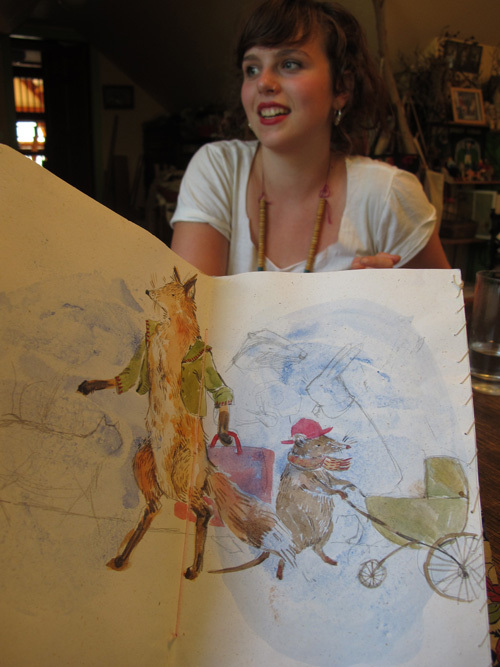 She draws beautifully, too and she showed me her sketch book. Look at this juxtaposition of pages! After talking with Phoebe for a bit, I spontaneously called my neighbor, illustrator Molly Bang and asked if we could walk over for a short visit. Phoebe remembers seeing Molly’s book, The Paper Crane when she was young, so it was nice to connect the two. Molly enjoyed meeting her and looking at her work, too. 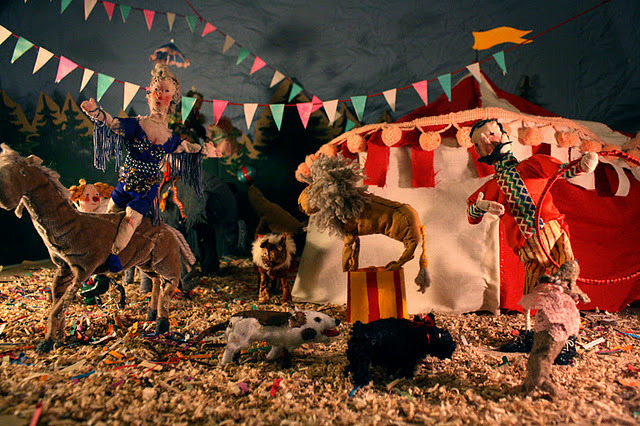 I recently saw on Phoebe’s blog that she’s made an animated film called CIRCUS. 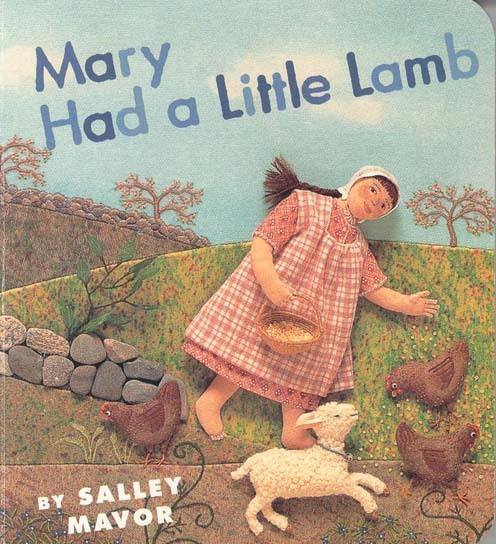 In a few weeks, she made a whole cast of animals and performers, then made the film all by herself in one weekend! The character’s movements could be smoother, but this animation shows such potential! She describes the film as an experiment and she plans on learning more about stop motion animation this winter. I’m so impressed by her diligence and artistic drive. She is really taking advantage of her time in school to try different ways of bringing her artwork to life. CIRCUS can be seen on vimeo here. 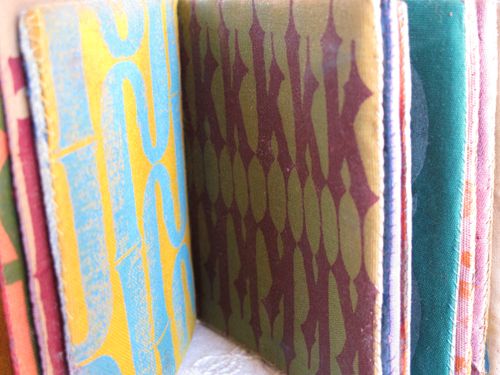 “I made ‘CIRCUS’ for Judy Sue Goodwin-Sturges’ Artist Book class. The assignment was to make a large book, using no paper, and we had another assignment where the theme was ‘circus’ or ‘carnival’. 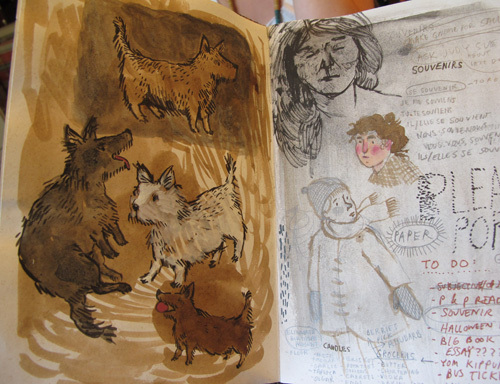 I was stuck trying to think of ideas for traditional artist books and decided to combine both assignments. 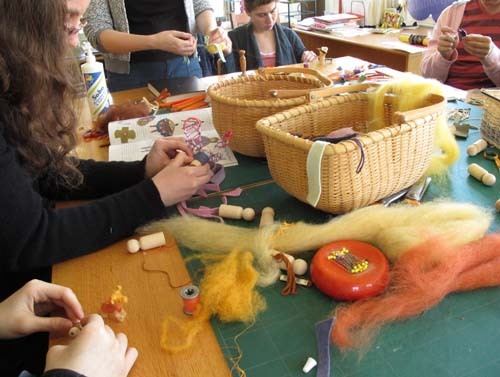 My visit to your studio definitely inspired me to start incorporating the handmade dolls and animals I have always loved to make into more of my schoolwork. Working hands-on sewing my characters into life is what feels right a lot of the time, although I will always love to make more traditional on-paper illustrations as well. 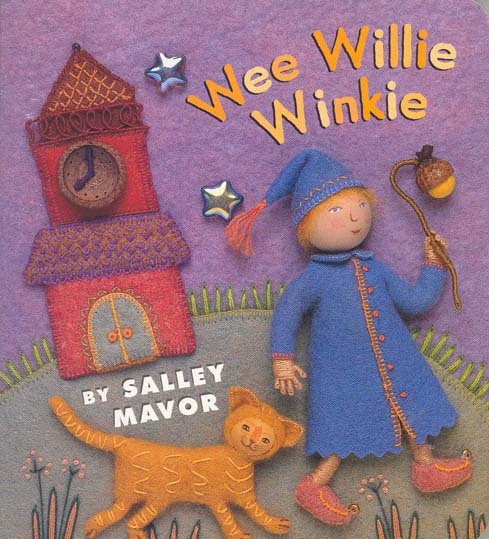 I loved seeing your work from when you were my age at RISD, how even then you were making things that spoke in your voice, and your characters were so wonderful and created with so much love. 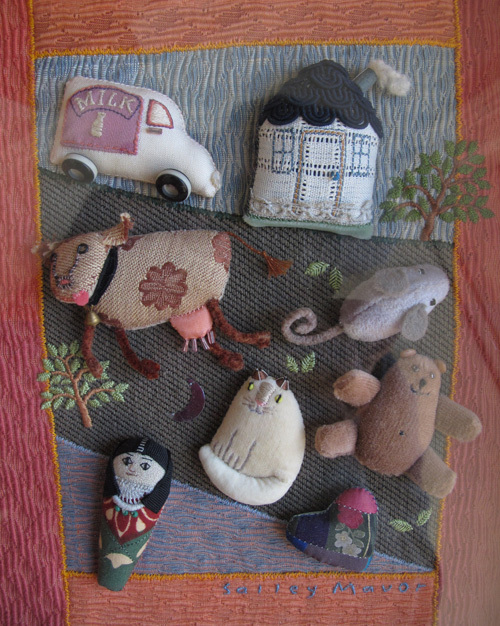 I was inspired to take my little dolls and animals further even if it meant stretching the boundaries of assignments, since the process of making them is so important to me. A lot of my work is rooted in nostalgia. 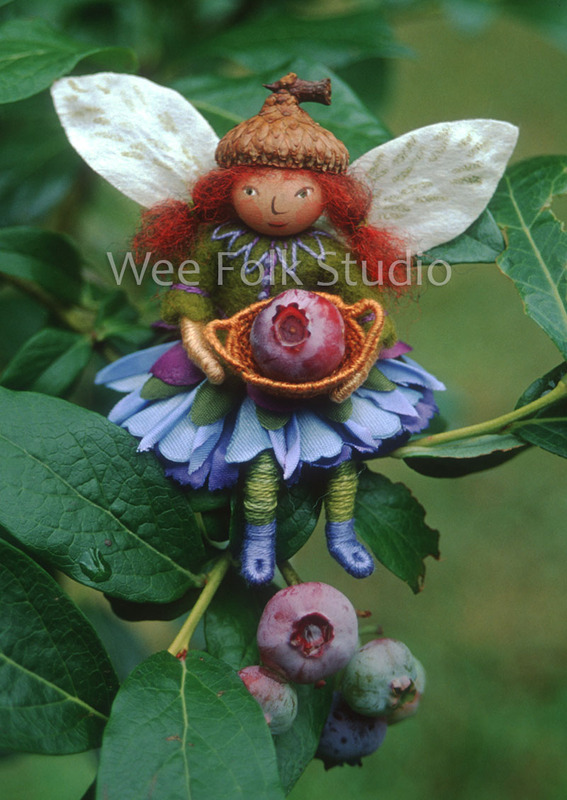 I feel like all the things I am drawing or painting or sewing, I am making for my childhood self. 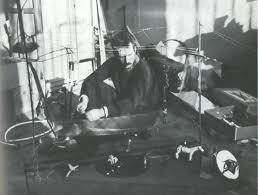 I think ‘CIRCUS’ is less about an actual circus, and more about a toy circus coming to life. That all the characters were touched and loved and imperfect is important to me. I find myself constantly illustrating places or people I want to be. I think ‘CIRCUS’ is an example of my constant quest to return to the magical places I inhabited as a child, where I didn’t even need a camera and a computer to make my toys and drawings come alive. 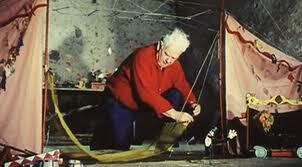 Phoebe’s circus characters remind me of Alexander Calder’s famous miniature circus (shown below). Phoebe sent a thank you note in this envelope. 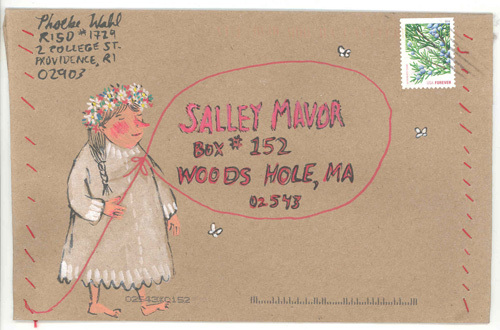 Be sure to look at her blog to see other envelopes she’s decorated. Thanks, Phoebe. I’m looking forward to seeing what you create next. We had a good day on Saturday at the RISD Holiday Sale. It’s been five years since I had a booth there, so it felt good to once again be among the 200 odd alumni who set up their wares. 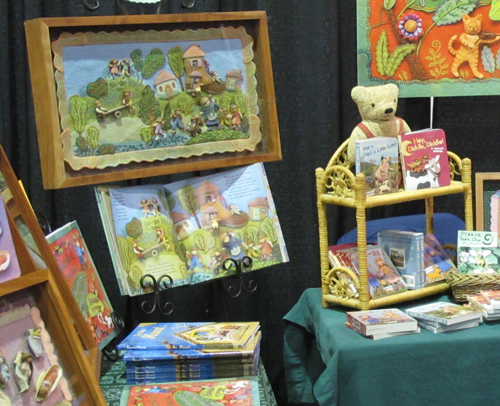 Since I don’t make kits or dolls to sell anymore, I brought books to sell. My husband, Rob was relieved that my setup was simpler than in the past. I used to make him haul twisty trees on heavy stands, but not this year. I hung up a large blowup of the cover of Pocketful of Posies, which my editor and the sales staff at Houghton Mifflin passed on to me. We were busy, which meant that I couldn’t take off and peruse the other isles. There’s always an eclectic selection of stuff at the RISD sales. Alumni from almost every department are represented; jewelry, furniture design, ceramics, printmaking, illustration, glass, textiles, industrial design, etc. Several people who follow this blog came by, including RISD illustration alumnus Ingrid Lavoie, who had her own booth with cut paper items. We talked about how a large percentage of illustration majors never work in publishing, but end up using a variety of art forms, and that their work usually has a storytelling element. 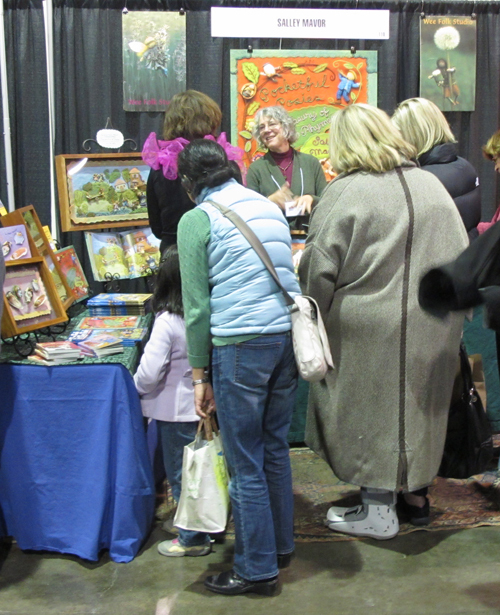 In my booth, I displayed some original illustrations from Pocketful of Posies, including There was an old woman who lived in a shoe. Kate Menard came by to have her book signed. 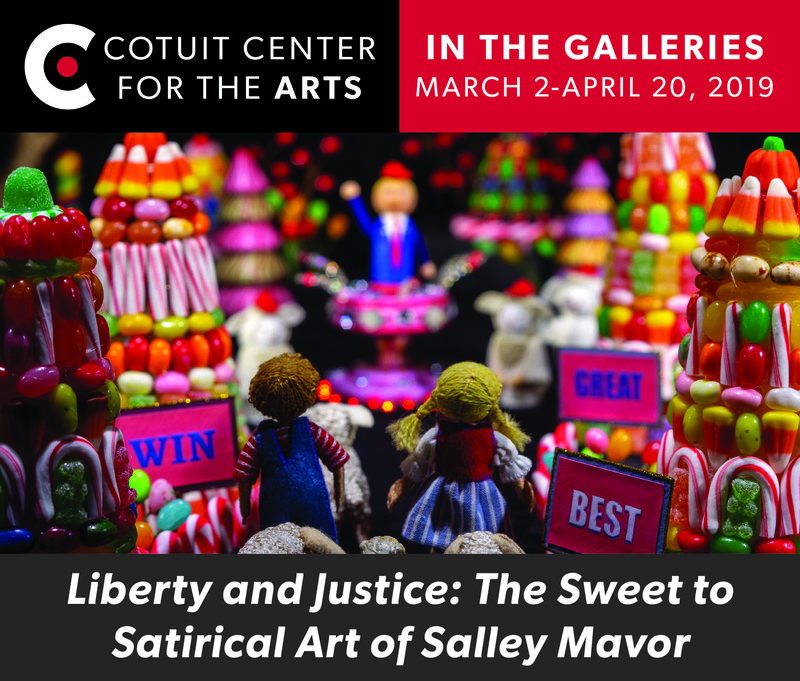 She told me that she’s bringing her parents to see my exhibit at UConn later this week. The show will be up through Dec. 16th. 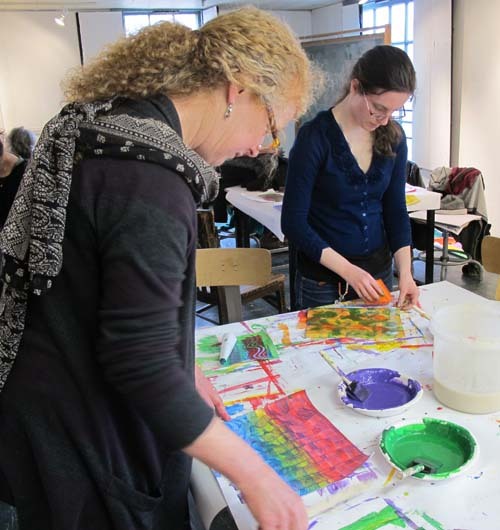 Recently, my friend Holly Berry and I have been doing projects with an illustration class at the Rhode island School of Design taught by our former teacher, Judy Sue Goodwin-Sturges. 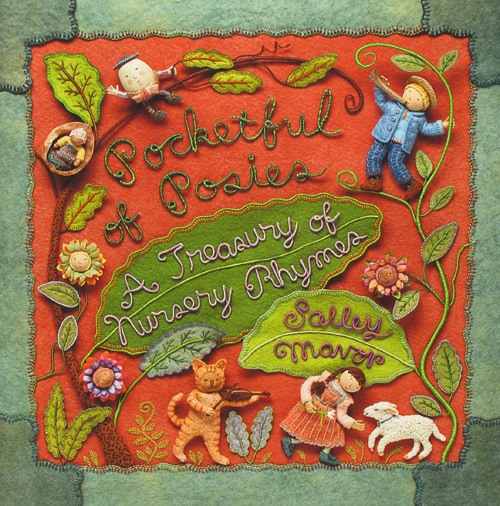 Holly is a successful illustrator and printmaker who has a wonderful style (see her website here). She brought in a load of supplies for the students to mess around with. 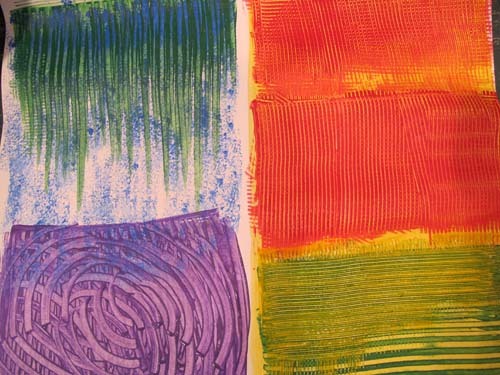 The whole point of our visits was to help bring back a sense of play to the student’s art making experience. I’ll show what I did with the class later in this post. 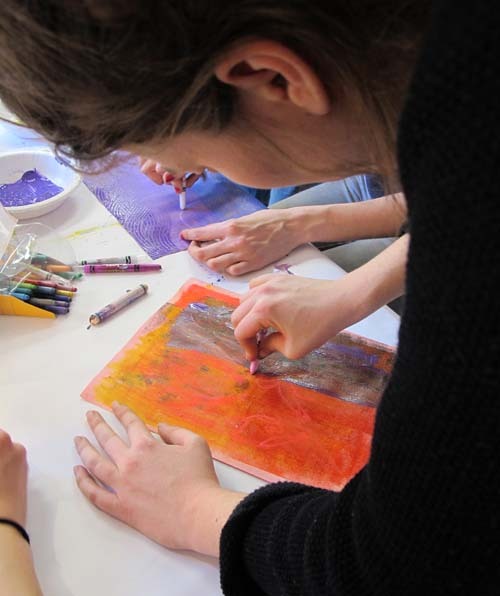 Holly introduced a way of decorating paper with a paste and paint mixture. The tables were set up with work stations like a Kindergarten class. 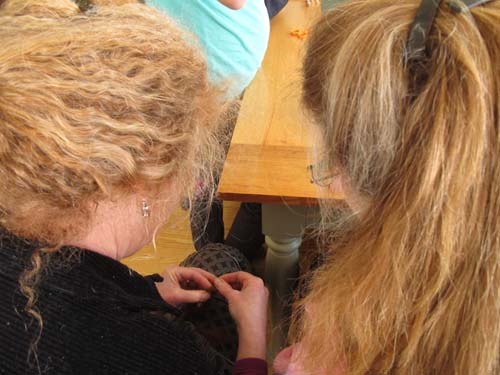 Holly provided all kinds of tools for making patterns, including rubber combs and textured rollers. 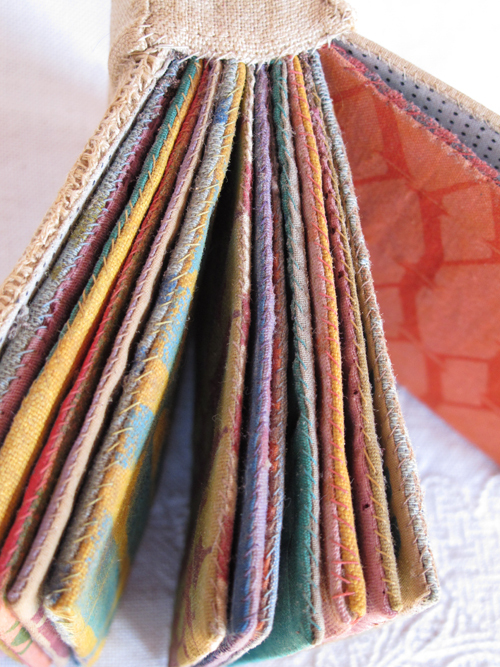 This is a fun way to loosen up and focus on color and textures without thinking too much about the finished product. 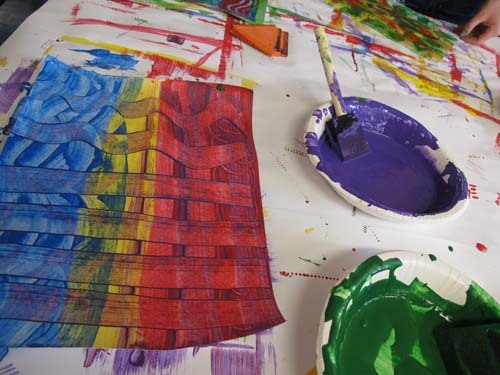 The class will later use their decorated paper in a collage assignment. 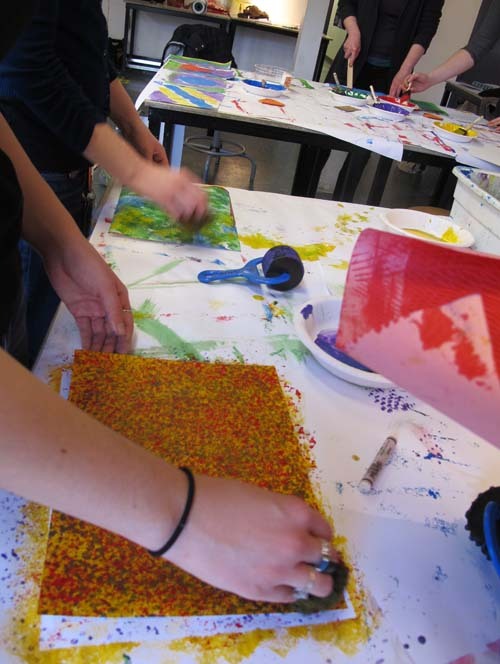 This students really seemed to love the experience of getting messy with such basic materials. On another day, I brought in baskets of materials for the class to construct a character. 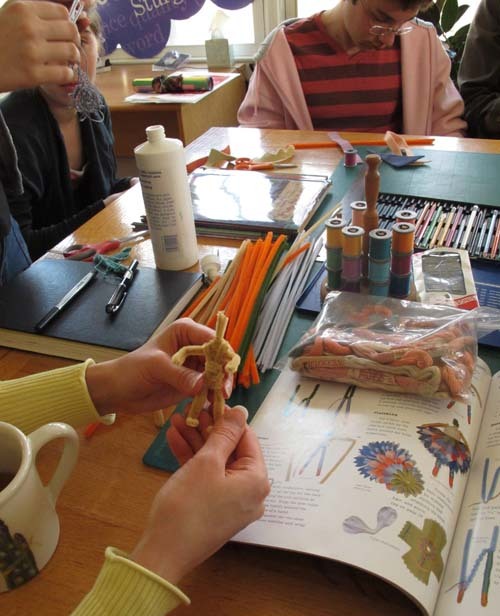 There were pipe cleaners, wooden beads, wool fleece, wool felt scraps, embroidery floss and acorn caps to work with. 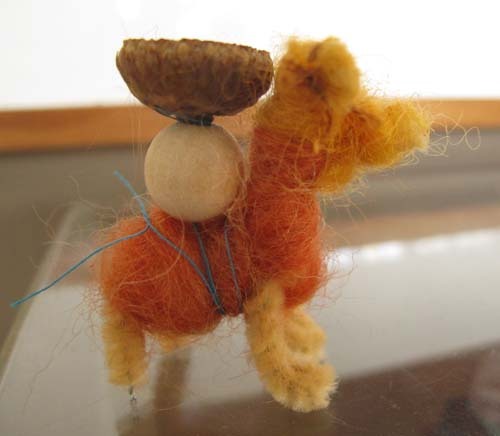 I gave a short demonstration on forming a basic armature for a figure, like in my how-to book, Felt Wee Folk. I told them that I didn’t want them to follow instructions on making a doll just like mine, but to play around and come up with their own designs. 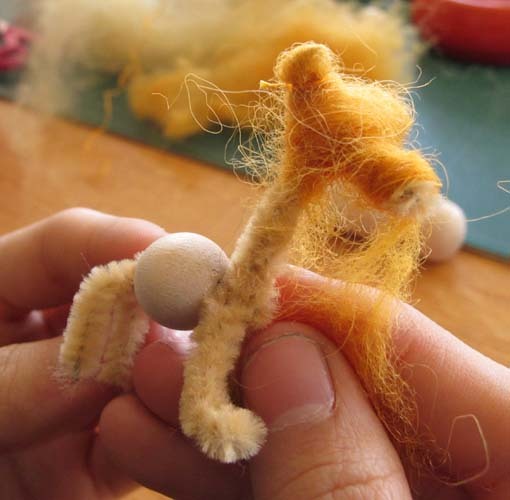 One student bent a pipe cleaner into an animal shape and started wrapping it with wool fleece. She then devised a way to attach an acorn cap carrier to its back. Holly and Judy Sue’s hair looked like the fleece we were working with. 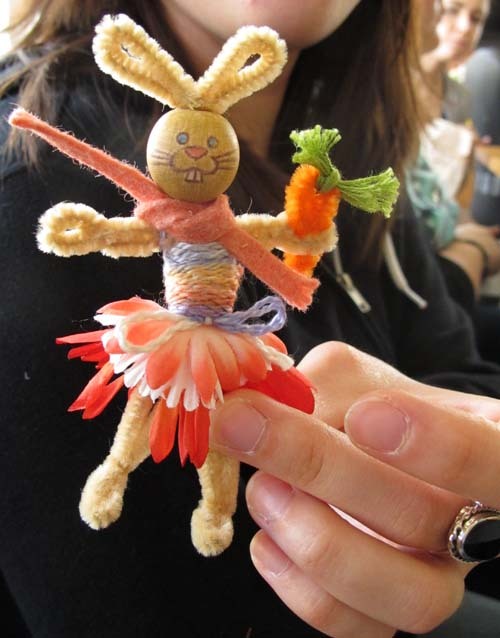 After about an hour of quiet concentration, the class made some really creative and fun characters, including this bunny rabbit. For the students, I think these hands-on projects were a welcome diversion from critiques and a reminder of why they make art. And not for him that sips. 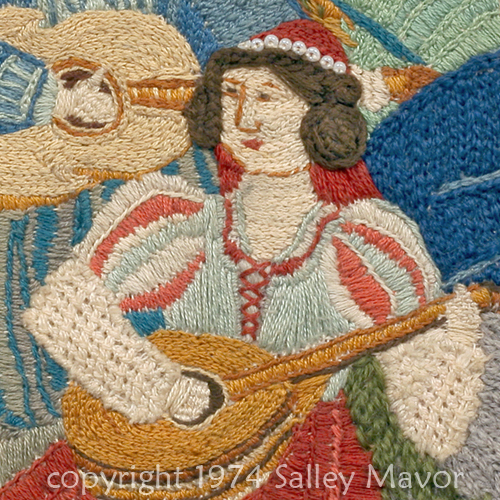 The first image in this Closeups series about music is from an embroidered scene I made for an illustration class assignment in 1974. I’d forgotten how much fun it is to fill in with a chain stitch! The lute player’s hairdo appeared years before Princess Leia’s coiled braids in the 1977 Star Wars movie. 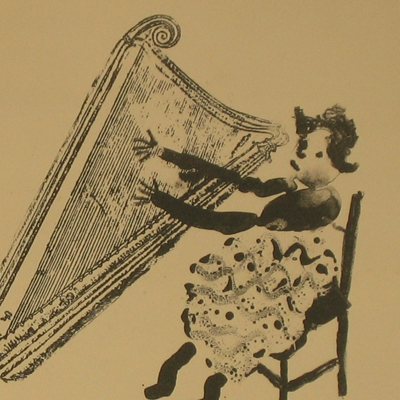 The harpist is a detail from a lithograph I made in art school at RISD in 1977. (see other lithographs here) I transferred a xerox copy of a harp image onto the limestone surface. 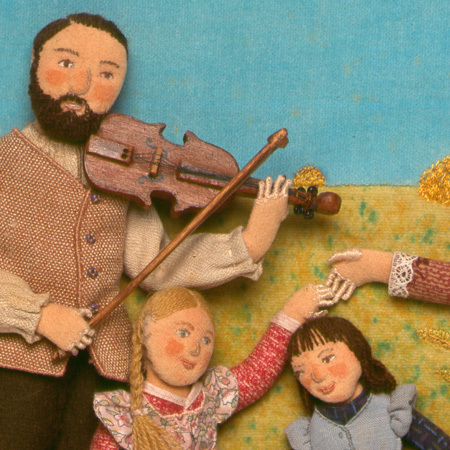 This fiddler is Laura Ingalls Wilder’s father, who appears along with his family on a CD cover I made for “A Little Music on the Prairie” in 1994. And yes, I did cut out the wooden violin, with the help of a jig saw. The tuning pegs are seed beads. See another closeup from this illustration here. 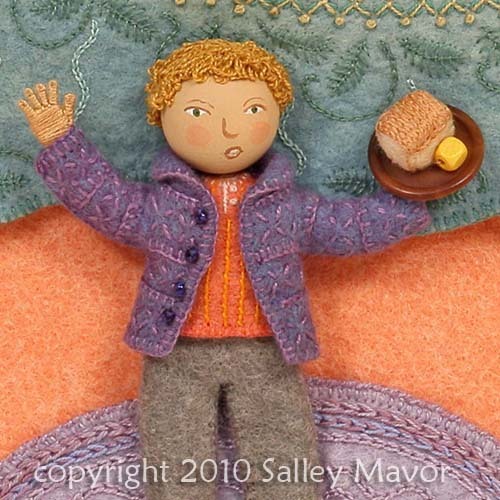 Here’s Little Tommy Tucker, who sang for his supper, from my book of nursery rhymes, Pocketful of Posies. 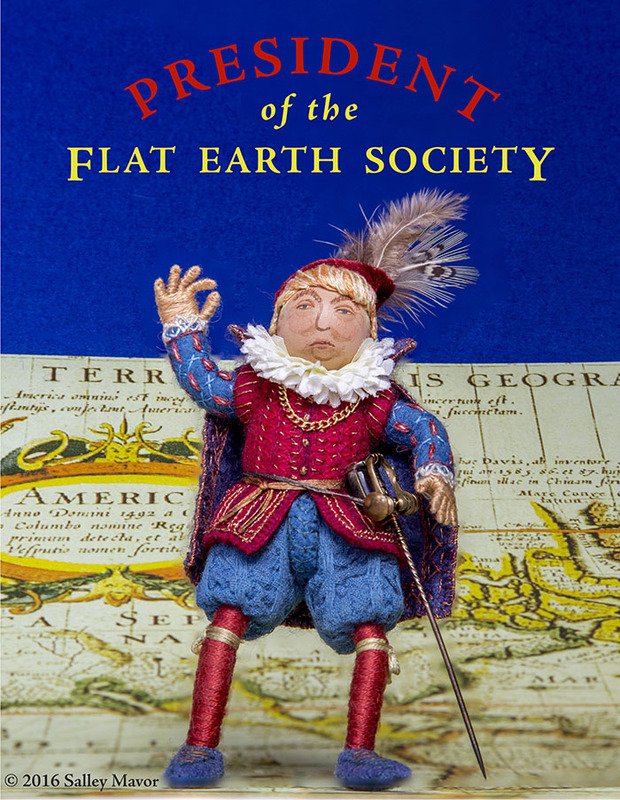 Autographed copies are available from my Etsy Shop. 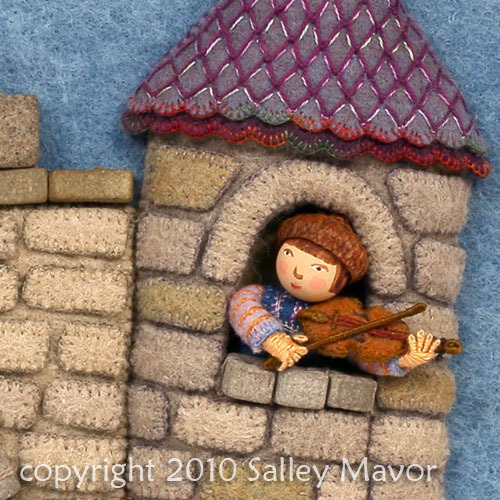 This is one of Old King Cole’s fiddlers three , whose felt fiddle is about an inch long. 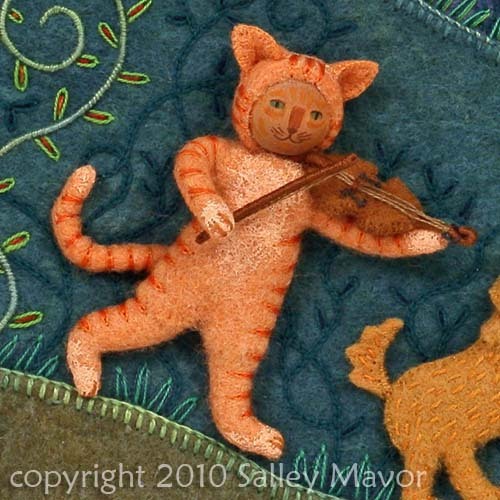 And the cat and the fiddle play on. 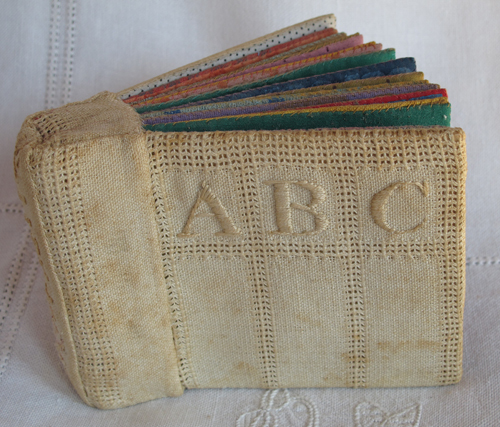 I made this alphabet book for a typography class at RISD in about 1976. The class was held in the basement of the graphic design building, where the old letterpresses were set up. As I recall, the assignment was to make something that used the large collection of metal type that came with the presses. I doubt the presses are still there, making space for all of the new computer graphics equipment. 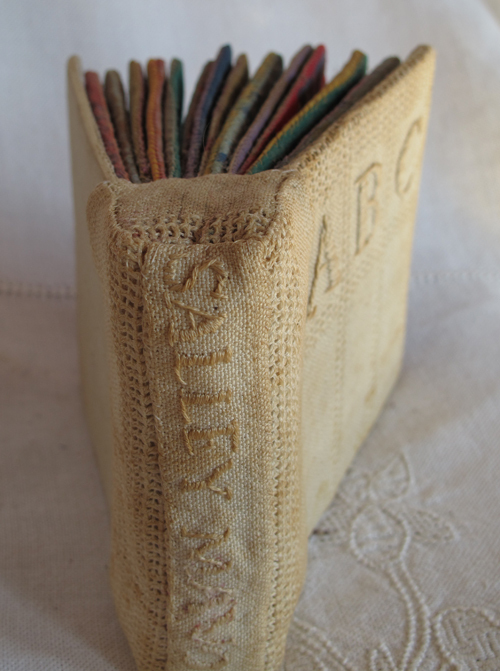 During this time at school, I jumped at any opportunity to bring sewing and fabric into my work. 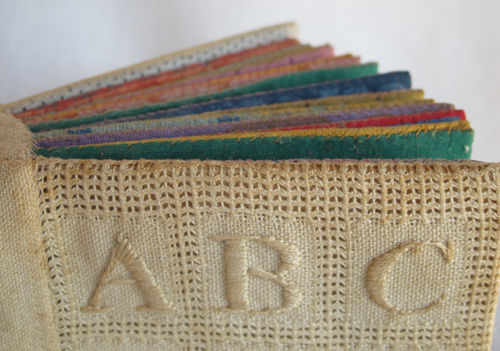 The old linen book cover is looking yellowed and stained. 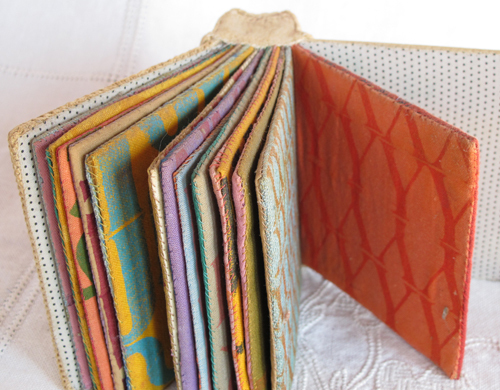 The 4 inch square pages are made from cloth-covered card board. 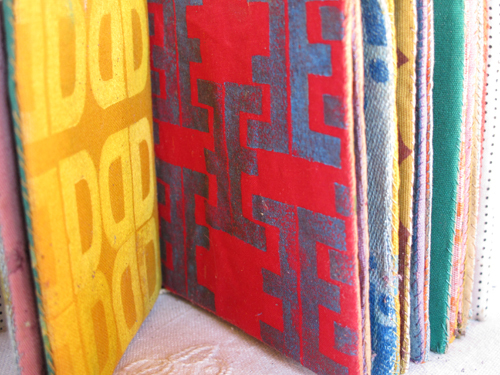 I rolled ink or paint on the metal type and stamped each letter of the alphabet, making patterns on fabric. 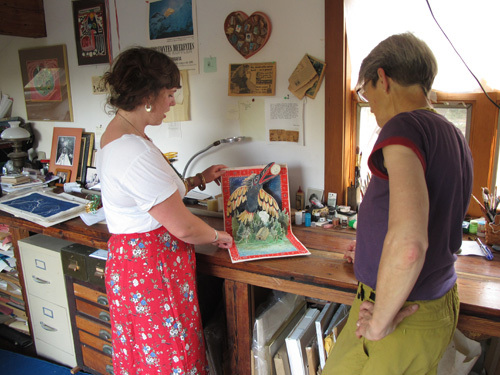 I recently visited Studio Goodwin Sturges in their new location in Providence, RI. 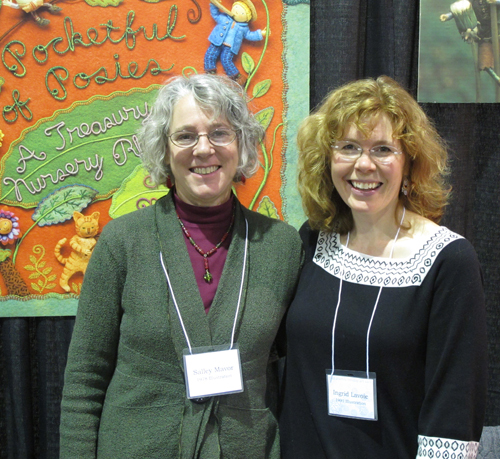 Judy Sue Goodwin-Sturges and I have known each other since I took her illustration classes at RISD in the mid 70’s. 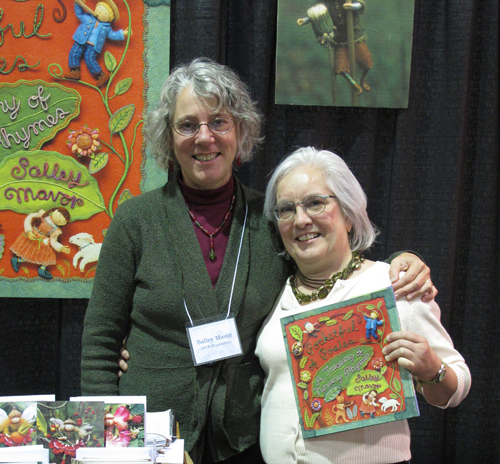 We’ve worked together on books since she started her studio in the 90’s. 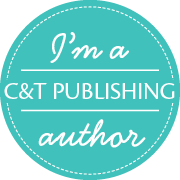 In addition to teaching, she represents a wonderful group of artists, some of whom are former students, and matches them up with publishers. Here she is in her studio office. 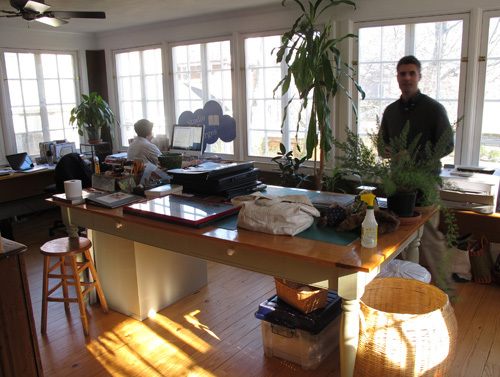 The studio moved from Boston to this window lit space in the back of her house. It’s located a few streets from where my mother grew up in Providence. 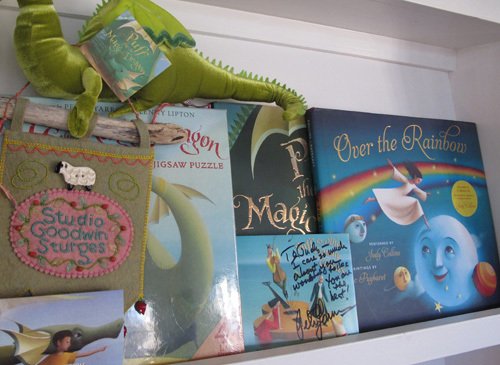 I saw a felt banner I made years ago displayed with some of the studio’s books. 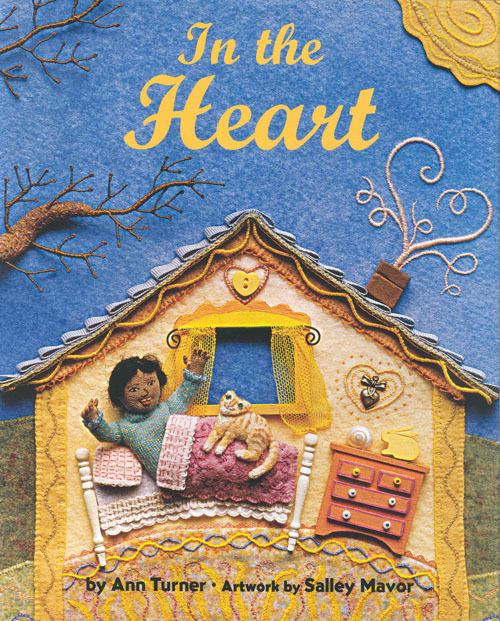 I didn’t know that they were involved with Puff the Magic Dragon and Judy Collins’ Over the Rainbow books. There’s a nice note from Peter Yarrow. 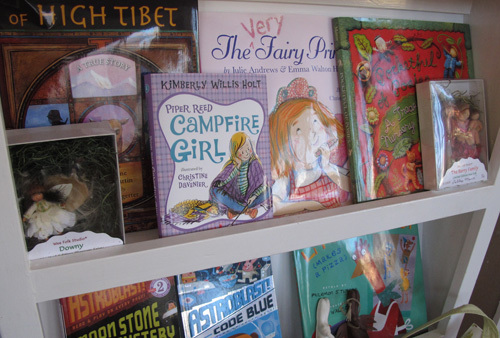 The Studio is a wonderful, supportive agency that has developed hundreds of children’s books. One box filled room was full of books that Judy Sue moved from Boston. 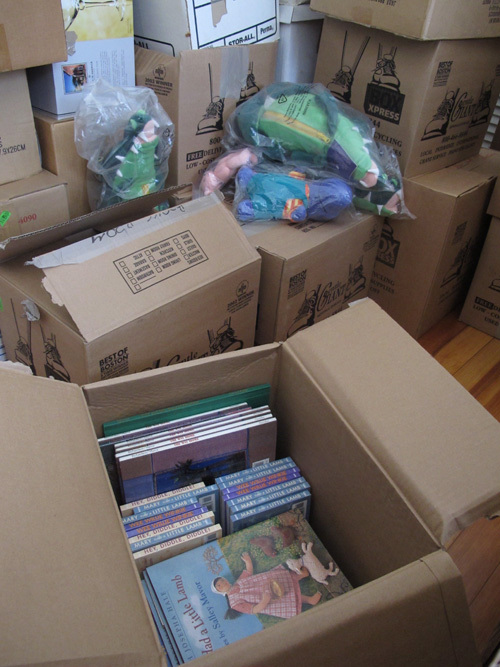 We combed through dozens of boxes until we found my books. She’s trying to down size, so she gave me most of what she had. 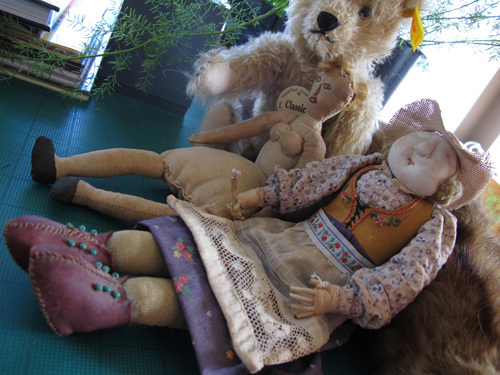 One of my early dolls was propped up on the center table at the studio. Her shoes and vest are made of leather. 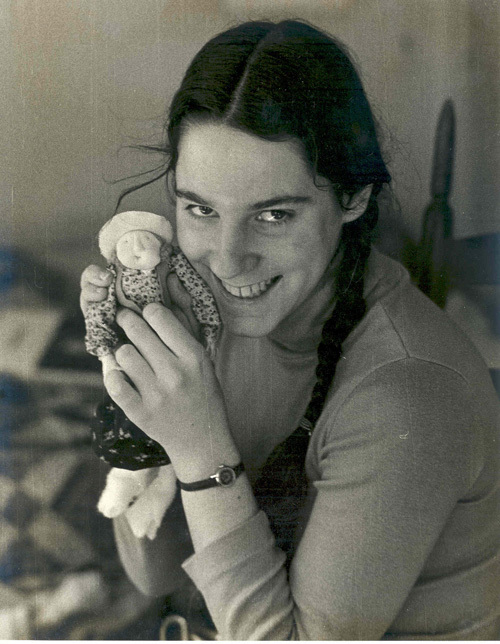 It’s the same doll that I’m making in the photo below, which was taken by my roommate at RISD in 1976. I also saw the framed pin display I made for Judy Sue sometime in the 80’s. This way she could see her collection. 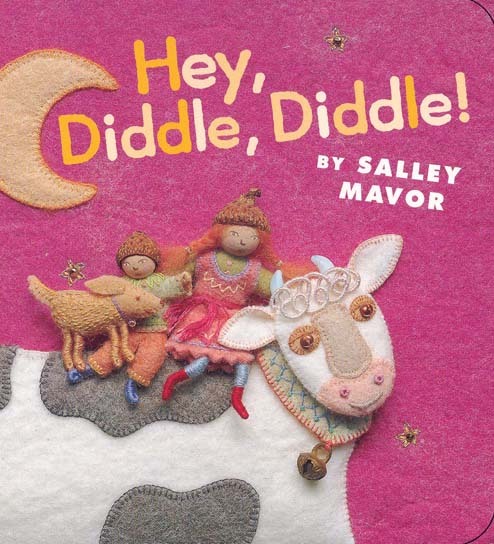 The custom-made cow may show my first use of bead udders. Visiting the new studio, with so many visible memories, makes me appreciate how much support I’ve received from Judy Sue to do what I love to do! I’ve written about how she encouraged me during my student years at RISD in earlier posts here. I love this picture of her with some of her former students, including Ashley Wolff and Holly Berry. Thanks Judy-Sue!